A truck is a truck, unless youre tricking it out with extra goodies to aim it at a particular market segment. Such is the case with the Chevy S10 Extended Cab LS, with the Xtreme package added to its regular list of accoutrements. This $31,105 (Canadian dollars) truck is nothing if not flashy and, if the stares it got from twentysomethings during my week with it mean anything, General Motors appears to have hit its target market bang on. Alas, that target market doesnt include me, a car guy, more at home in a car - and to a lesser extent an SUV or minivan - than a big hulking truck. But that doesnt mean this truck has no raison detre by any means; in fact, I have a feeling Chevrolet will sell truckloads of them. 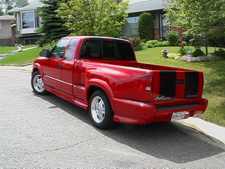 The S10 can be considered as a compact pickup, much like most of the mainstream Japanese competition. The Extended Cab LS Xtreme comes with a deeper cab that includes two side-mounted jump seats in the rear, making it suitable for two adults up front and two children (or very tolerant friends or family members) in the rear. Those rear seats arent the best way to experience an extended trip, but theyre fine for shorter hauls. Actually, the truck worked fine; it wasnt its fault we got stuck (and we wont go into whose it was! ), and on the whole it performed very well under the circumstances. The current S10 has had the better part of twenty years to evolve, and its a pretty nice truck. The seats are supportive and comfy and the creature features abound, so much so that, werent it for the fact that otherwise this looks, sounds, and acts like a truck, you might think while sitting inside that its a high car or an SUV. But a truck it is, indeed, as evidenced by every frost heave or expansion joint on the road, at which time the S10 shudders and bounces and the ultra-light rear end announces that if you want real handling youd better put some bags of cement back there pronto. In short, it drives like a truck. Well, duh! Isnt that what its supposed to do? And talk about a snazzy truck! It has plenty of get up and go, too, thanks to the optional Vortec 4300 SFI V6 engine with which my tester was equipped. Horsepower is rated at 180 @ 4400 rpm (2WD; the four by four gets an extra ten horses) and the torque is 245 lb.-ft @2800 rpm (250 for the 4WD version), so those who love this type of vehicle will find this puppy has plenty of poop, delivered to the street by a four speed automatic transmission with overdrive. The Xtreme stops well, too, keeping in mind the light rear end. Braking is performed by power discs up front, with drums in the rear (I mean the brakes are of the drum persuasion; I never hauled a drum kit in the S10s bed, though I did put an electric guitar into the extended portion of the cab). The brakes include an antilock feature that takes the skull sweat out of threshold braking. Suspension is independent, with stabilizer bar, up front, and the rear end gets two stage multi-leaf springs. Some nice touches include GMs automatic headlamp control, which turns the exterior lights on without operator interference, intermittent wipers, swing out rear vent windows and a pretty good AM/FM/Cassette/CD stereo system with a nifty automatic volume control that helps keep the sound at a constant volume relative to the vehicles speed (and, since this is a truck, accompanying road/wind noise). This latter feature works quite well and frees your right hand from endless knob twiddling. You also get an air conditioning system that works very well when its really hot outside (which it was during my test), including a maximum setting thatll almost keep the champagne youve stuck in the spacious centre console chilled. My Xtreme tester also came with the convenience group that included power everything and a remote entry keyfob. Xtreme features include color-keyed bumpers and grille, a nice set of 16 inch aluminum wheels wearing P235/55R rated all season radials, a set of ground effects body stickons, fog lamps, specific Xtreme badging, the sport suspension, leather wrapped tilt steering wheel, deep tinted glass, a sliding rear window, and cruise control. Its a pretty extensive list that, as mentioned, brings the total price of the vehicle to just over $31K Cdn from its base of $20.6K Cdn. My Xtreme was a bright, bright, bright red; while I was driving it I also saw a version in a bright, bright, bright yellow driven by some kid with a grin on his face so broad that it was obvious he was in his element. Which means that Chevrolets marketing people have done a good job at taking a pretty standard small pickup and turning it into a real head turner.